How Do You Spell Sycophant? L.I.B.E.R.A.L. Liberal frontbenchers and MPs were angry yesterday when the Nationals leader, Warren Truss, and the Senate leader, Barnaby Joyce, ridiculed a free-trade pact entered into by Australia, the US and other nations at the Asia-Pacific Economic Co-operation summit in Hawaii. The Liberals support free trade and the proposed partnership and were dismayed yesterday when Mr Truss rubbished it as a ”thought bubble” by APEC leaders, including the US President, Barack Obama, who arrives in Australia tomorrow for a 26-hour visit. ”It is simply inconceivable that the United States would agree to remove trade barriers in what is an election year,” said Mr Truss, a former trade minister. I agree with Mr Truss. And loudly applaud his having the testicular fortitude to say so. Although I’d go even further. The USA has form. It is inconceivable that the United States would agree to remove their trade barriers at all. Despite Mr Obama announcing at last year’s APEC in Yokohama, Japan, that he wanted progress on the partnership when leaders met next in Hawaii, Mr Truss said the announcement on Sunday was designed ”to make a conference look like it was useful”. The Nationals believe the deal could have an adverse impact on sectors such as agriculture. Mr Truss’s comments were at odds with Coalition policy and comments by the deputy leader and foreign affairs spokeswoman, Julie Bishop, who believes the partnership needs to be encouraged. Privately, Liberals were furious. ”It’s a US initiative and we should embrace it,’‘ one said. We should embrace an “initiative” because it’s a US initiative?!?! That’s the kind of “logic” that got us wasting billions of dollars … and far more importantly, priceless lives … in Iraq and Afghanistan, dancing to the tune of the bankers’ rhythm-and-blues smash hit, Warring About My Endless Profits. It’s the kind of “logic” that has our banking system buried under $16.8 Trillion in derivatives … with the galactically bigger carbon derivatives scam still to come. And it’s the kind of logic that prompted our World’s Greatest Finance Minister to use taxpayers money to buy up $20 billion worth of “financial weapons of mass destruction” known as Residential Mortgage-Backed Securities (RMBS). Not familiar with that word “sycophant”? 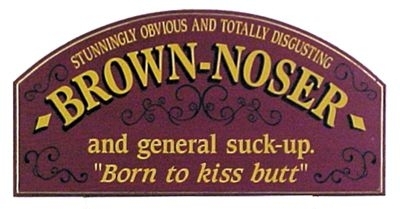 Now, while “brown-noser” is essentially identical to “sycophant”, it is spelled a little differently. And that, dear reader, is a huge part of the problem in this country. Two “sides”. No essential difference. Like “brown-noser” and “sycophant”, one is just a cruder version of the other. And the truth is, both are always trying to insert something up your @$$. It’s time for the Nationals to really go it alone. I’d actually consider (cough, splutter) joining if they did. Provided one of their independent policies, was to never again be a party to sending other people’s kids off to die as part of a bankster-enriching Coalition Of The (S)Willing.